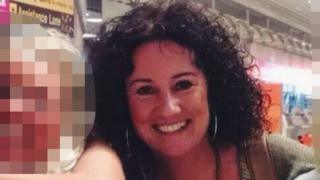 Image caption Jane Tweddle has been described as a "truly wonderful friend and colleague"
A 51-year-old woman confirmed as one of the victims of the Manchester terror attack was killed as she waited for her friend's children. Jane Tweddle, from Blackpool, was a receptionist at South Shore Academy School in the seaside town. Ms Tweddle had been waiting with her friend, who survived along with her children. Jane Bailey, principal of South Shore Academy, said she was a "truly wonderful friend and colleague". "As our receptionist, she was in many ways, the public face of the school and she represented us amazingly in this role," she said. "We have received numerous messages of condolence from parents, students, community members and colleagues across Blackpool for which we are very grateful. "All of them say the same things about our lovely Jane... bubbly, kind, welcoming, funny, generous... the list goes on. "Our thoughts are also with her family at this dreadful time and in particular her three daughters. In our school family and theirs she is irreplaceable, much loved and will never be forgotten." A two-minute silence is to be held outside Blackpool Town Hall at 12:00 BST on Thursday, where a book of condolence has been opened, to remember Ms Tweddle. Leader of Blackpool Council Simon Blackburn said: "We send our deepest condolences to the family, friends and colleagues of Jane, a valued and respected member of staff at South Shore Academy. "This is an incredibly tragic event and our hearts and prayers are with everyone." The town hall flag will fly at half-mast all week and Blackpool Tower will be lit up red, white and blue in honour of the victims of the attack, he added.